We’re all familiar with feeling anxious. It’s not pleasant. Heart racing, butterflies in the tum, can’t think clearly. What if you lived like that most of the time? For months at a time. What if you lived with an impending sense of doom or low-level anxiety that has you checking the doors and windows are locked, repeatedly, on a hot summers day? What if your child did? Many people don’t consider children to have valid emotional lives, so can’t grasp that children can experience chronic anxiety. Anxiety looks different in different children which can also make it tricky to understand. It’s at the root of uncontrollable angry outbursts or sullen non-responsiveness, sleep issues, power play around food, panic attacks and all sorts of behavioural stuff. There are as many ways anxiety can manifest as there are people. The more I talk to people about anxiety, the more I hear about OCD behaviours, sensory issues, struggles in school, highly sensitive children and all manner of quirkiness. It’s made me realise we are all on various spectrums and frankly it’s been a relief to know how many people are experiencing deviations from the norms depicted in mainstream media. Thankfully there is growing awareness about how neuro-diverse we humans are. There is so little we know about genetic predisposition, chemical and nutritional balances within the body, the intricate body-mind dance and how the energy of those around us affect our development as children. There is so much we need to explore and discover about being human. About why some people are more prone to extreme anxiety than others. Connection. From years of experience working with children, and more recently sharing life with my own anxious child, I understand how vital the work of connection is. It is the first things that works to help my boy to land when he starts to spiral off into anxiety. It’s a simple and very powerful tool we all have access to. It makes all the difference. I make sure we’re feeling connected before we whirl off into the day. We used to snuggle in bed and read together but these days a simple heartfelt How are you doing? does the trick for us. We have a private sign language so we can stay connected and check in when we’re in group situations too. For years, at bedtime, we would share our favourite thing of the day and our challenge of the day. This helped me stay in touch with what was important to my son, allowed him to process the day with support and was a great way to connect. Use a scale of 1-10. When feeling anxious we identify it, stop, take a deep breath and rate the thing we are anxious about on a scale of 1-10. (1 is having a nice time swimming, 10 is the house burning down.) Putting things on the scale helps with perspective. Maintaining a culture of mindfulness and an emotional language in our family has been so helpful. When someone is snappy, or being passive aggressive, or is otherwise out of behavioural alignment, we call it being ‘out of balance’. I suppose you could call it disconnected. And children always, always want to be connected. The bigger the squawk or harder the shove, the more desperate they are to feel close and loved and connected again. I have come a long way from my inherited passive aggressive-with-occasional angry-outburst parenting style. I started this work before he was born and it’s been so worth it. My son is ten now and highly emotionally articulate and aware so the work of reaching out and supporting him to take care of himself to get back ‘into balance’ is easier. So cool to see. Warn about changes. Giving your child plenty of warning about upcoming changes and things. We keep a weekly calendar so we all know what’s coming up. Find books that help. Books like The Worry Bug and others that talk about anxiety are soooo helpful! (We love books). When my son was younger and had a hospital appointment coming up it really helped to read books about different children’s experiences and feelings around operations and being in hospital. We talked to another child who had been in hospital, we visited the hospital and play specialist before the big day. Hang out with people who get it. It’s been so helpful to have adults in our daily lives share their stories about anxiety and what they do to manage it. Not in a preachy way, but just part of normal conversation…you know kids…they may be deep in play nearby but those ears are still tuned to grown up conversations. Through them it’s normalised, because it IS normal – we’re all on a spectrum – and my son has appreciated hearing stories about our friend who is terrified of flying but travels widely for the work she loves. Or our neighbour and local librarian who talks freely about how anxiety affects her before travelling. We’ve had great talks with a bunch of kids about all the things we’re afraid of – buttons, starting new things, the dark, even kittens. Yup, we’re all so different. Be your child’s advocate. This is so important and can be tricky when others don’t understand. For a few years there my boy didn’t cope very well with groups, unexpected additions of unknown playmates would have him shut down and we’d have days/weeks or months of processing the event. He would specifically ask me to arrange one on one playdates with his friends. I supported his choice in focussing on one on one playdates as a way to take care of himself despite being given a hard time around it by other parents. Acceptance. Not making your child ‘bad’ or wrong for their feelings. Cultivating a family culture of exploring emotional landscapes together. Maybe learn mindfulness and/or some kind of meditation together? Counting to ten. It’s an oldie but a goodie. So is stopping and taking a really deep slow breath. Touch. When words fail, touch speaks really loudly. Sometimes I can’t reach my anxious child by talking but touch might work. Hugs are good but massage is magical…it relaxes him and reconnects us. Identifying what the triggers and warning signs are. Know the signs that let you know that your child is starting to go off on the anxiety spiral. I won’t go into these as they are all so different. There’s a certain tone of voice we look out for. In peak triggered anxiety just be connected and present. High adrenaline times are useless for reminding them to use tools or problem solve. Once your child is landed and balanced again (often hours or maybe days later) you can talk about what they might do differently next time. Look after yourself and do your own inner work. Keeping calm in the face of someone you love freaking out is hard. Make sure you have understanding friends you can call on to support you. Take a break when you need to. What would you like to say to a parent of a child with anxiety? Please don’t just say ‘it’s not scary’ or ‘don’t worry’. It makes people not feel heard and makes the anxious feelings worse. What are some tools that help when you feel anxious? Deep breaths. Counting to ten. Do not say go have time out, because your child will be terrified. That’s pushing your child away. When you are anxious you need to be close. You need connection. 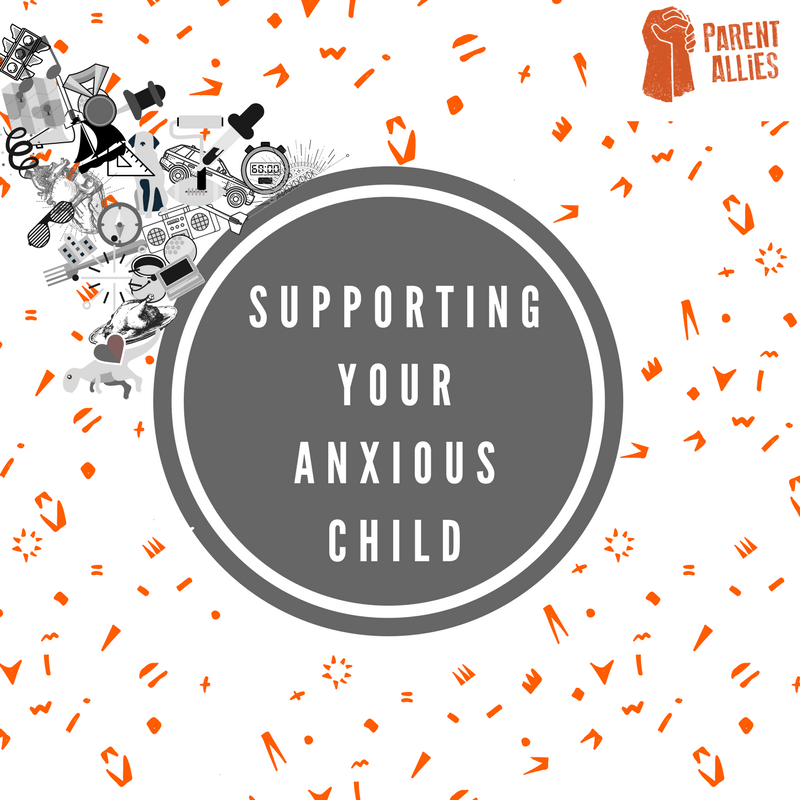 What can parents do to support their child when they’re anxious about something specific? Sometimes take whatever is freaking them out of their lives for awhile. It sometimes helps when grownups share their experiences about similar times when they were really anxious and the things they did that helped. Can you give some guidance to parents about how to be a good parent? The most important thing of all is to have someone to talk to and share distressing stuff with. The main thing is you HAVE to have someone to connect with. Where you feel safe and all of you can be loved. Strength and much love to you and your family if you are living with chronic anxiety. It’s a journey. I have learnt so much about myself and the world through our experiences with it. Anxiety has been a great teacher for us, and we are more compassionate and self aware as a result. There are gifts in the hard times. Hang in there, things shift. May you find the tools and the connection and support you need. Anissa Ljanta is a mama, writer and change agent with many stories to tell. She’s lived or travelled in a bunch of countries and just about fell off her chair when she worked out she’d been away from NZ for 16 years. She now lives on the wild west coast of NZ’s North Island. She is passionate about connected parenting and exploring the dilemma of being a good human and how to live sustainably. She blogs over at Growmama.blogspot.com. I love this. It’s so understanding and helpful. I am going to save it and share it, we all need to read this. Thank you. I wish my parents had this information when I was a child, but I’m thankful to have it for my children. Great article but what does a parent do when being close, touch, encouraging deep breaths and counting, asking how they are doing all sets them off 10-fold? My daughter is 9 and has had symptoms of severe anxiety since 2. Absolutely none of this works and agsin, only makes it worse right before the moment, in the moment or even after she has settled back to baseline.